Many clients call us for weddings on yachts in Miami or Fort Lauderdale. Getting married on the water is a fun, unique and original venue for a wedding and not as expensive as you may think; in the first place, weddings and other special events on yachts are generally organized as all-inclusive packages that may include the wedding ceremony, (generally performed by the Captain or an officiant of your choice), the champagne toast, table center pieces, the Wedding cake, ceremony set-up, a buffet or plated sit-down dinner, and all beverages. Bar choices and menus can be customized to meet individual requirements. You can usually dispense with a wedding planner since the yachts coordinators and our own in-house specialists take care of all the details. Of course, if your wedding also includes a land-based part like perhaps, having the ceremony in a church or on the beach, a planner could be useful for this part of the wedding. Not all planners understand that what may work on land may not work on a yacht and the rules can be very different. For example not all yachts will allow candles but some will allow candles in containers that are higher than the naked flame. There are over 50 different party yachts in S. Florida and NYC that are suitable for parties and groups of different sizes from 12 guests all the way up to 500 guests. There is also a wide selection of pricing options from about $90 per person all the way up to $200 or more pp. 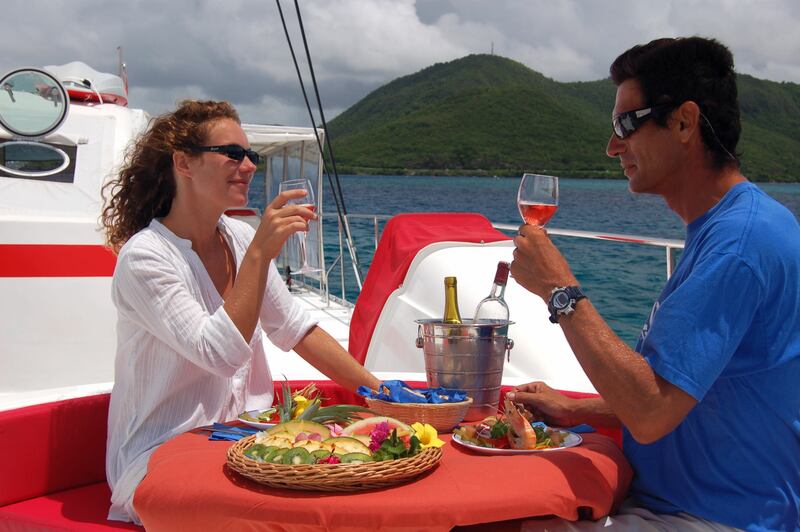 This will depend on the boat you choose, the number of guests, and the menu and bar options. Generally speaking a yacht wedding can cost less than a land based wedding as you do not need as much in the way of decoration. The yacht itself is decoration. It can also be said that you are giving your guests a gift! American Yacht Company and it’s main party yacht website, provides you with an enormous selection of yachts and packages that are available in S. Florida and New York City. We are an unbiased independent charter yacht booking agent, we have no allegiances except to our clients. We are not affiliated with any of the yachts and have no axes to grind. Our advice and services are free. You can trust our 10 years of experience, and our recommendations and advice on the different yachts that would be most suitable for your special event or wedding on the water. We will always try and guide you in the right direction depending on your requirements. We not only know the yachts but we know the Chefs and the Crew and the owners of these yachts.